I likes free downloads. Thems makes me very happy, even when I know the price is potential adiction to a full product line. It's a worthwhile gamble, especially if you're just looking around for ideas, art and inspiration for the campaign and system you are already running. 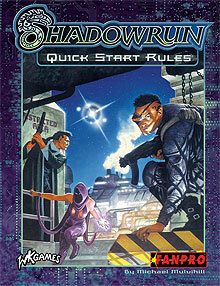 Today I re-introduced myself to Shadowrun. Shadowrun is now in it's fourth edition. My memories of the launch of the 1st edition were with a mixture of feelings, similarly expressed was the snobbery from Cyberpunk-ers and RIFTS players. The art looked great, but I remember wondering why anyone would want elves and goblins in Blade Runner. As I've said before, back then, my view of genres as campaign setting was pretty strict. Shadowrun looked like something a younger brother would bring to the table - a mix-up of everything they liked from other games. 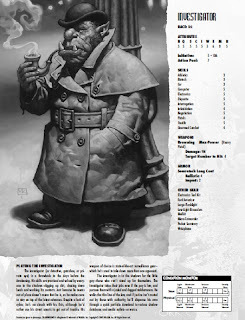 Parallels could be made with the lazy quasi-humorous translation of fantasy Warhammer into Rogue Trader/40K with it's Squats, Space-Orks, and Eldar - and later the dropping of some races because they just weren't aesthetically cool enough. However, in contrast to this perception it seemed to take itself very seriously. In these post Buffy/Angel days (and all of the TV series which followed), where everyday magic, assimilated demons, vampires were explained with ethnic, counter-culture, alternative lifestyle metaphors, I feel more ready to accept the potential richness of the Shadowrun setting. Possibly, I'm so shallow, that I will not accept a setting unless I've seen it in a film or read the book first. Shadowrun looked like a derivative "meta"-game, like (the implausibly popular) Blood Bowl - an in-joke between gamers. Judgimg by the number of products and editions the publishers must have been doing something right. Looking at Shadowrun now, it looks as though it could have been a real blast to play, either seriously or with humour (again back to jokes vs. apocalypse Buffy and Angel). So now I'm wondering if I seriously missed out on something. But at least now, given the chance I could get my teeth into the basics. If you're a die-hard Shadowrun fan, but haven't been back there for a while, you might be curious enough to have a look at the platinum bestseller Shadowrun: 4th Edition 20th Anniversary Core Rulebook (Catalyst) -PDF $15. Check out also the free PDF quick start rules for 4th edition on the Catalyst website. Are you sure we're not twins?! Somehow reading Dresden Files (the novels not the game) I might be desensitised, actually no I still can't stand elves!